Dr. Fred Schwarz is one of America’s great heroes. In his 50 years of work in the United States, he trained a whole generation to recognize the evil and the danger of Communism at home and abroad. He was a major force in building the conservative anti-Communist movement and in supporting Ronald Reagan’s goal of defeating the "evil empire." America is at a crossroads. Nothing could be more important to our Nation’s survival as a free republic than the ideas expressed in this book. 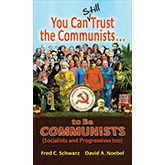 Its publication brings afresh to a new generation the work of a pioneer scholar, Dr. Fred Schwarz, and his able successor, Dr. David Noebel, in a timely way that could save America from its impending moral and economic collapse. I was first stirred to apologetic action by Dr. Schwarz a half century ago. His messages against the encroachment of Socialism are as needed now as they were then. Every able Christian should carefully ingest and courageously act upon the message of this book. An Australian doctor said, "the three basic tenets of Communism are atheism, evolution, and economic determinism." Then he said, “The three basic tenets of the American Public School system are atheism, evolution, and economic determinism.” Four years later Dr. Fred Schwarz wrote his masterpiece You Can Trust the Communists (to Be Communists). 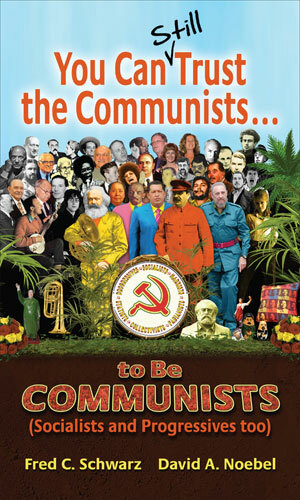 The republication of this book could not be more timely as America decides whether to follow its Christian forebearers or once again test the poisonous waters of Marx, Lenin, Mao, Castro, Alinsky, and their swarming collectivist agents and "useful idiots" in their relentless attempt to dethrone God and destroy Capitalism.